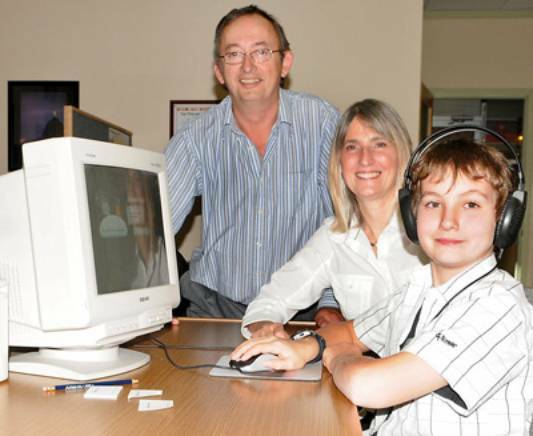 Nicholas Chubbs-Hart, 12, is learning Fast ForWord from Accomplished Learning Centre’s Ross and Lisa Pearson. A computer program that makes lifelong changes to a child’s ability to read and understand language is proving so successful that the school that brought it to Langley is expanding.When Lisa and Ross Pearson opened the Accomplished Learning Centre in Langley Mall four years ago, they could not have anticipated the huge amount of interest, and the astonishing success of its programs, among them Fast ForWord. Fast ForWord is a computer program that helps children master the art of reading, and understanding what they read. Touted as one of the most important and dramatic developments in education, Fast ForWord works by “re-wiring” the brain. With results coming in a matter of weeks, the program is being adopted by a growing number of school districts, including Surrey. The program was developed by a neuroscientist after decades of research probing the reasons for learning and language problems, reading difficulties and dyslexia. Fast ForWord consists of 11 programs, and students use them according to age and need. Its ability to change the brain permanently has been proven by functional MRIs — scans which show the brain in motion. Children’s progress after only a few sessions of Fast ForWord is nothing short of astounding. Lisa Pearson relates the progress of one of her students. This student was breezing through school work which once would have left her confounded and in tears. She is seven years old. The Accomplished Learning Centre is Canada’s largest provider of the Fast ForWord program, and last year became the fastest growing learning centre in North America to offer the course.